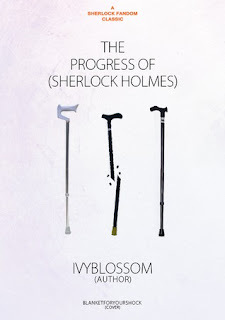 The Progress of Sherlock Holmes by Ivy Blossom. When I was living at Baker St once more, after my second marriage, I often came home to find Sherlock unmoved from his position that morning, or gone for long periods of time during which I heard not a single word from him. I worried as I used to, but soon remembered my old habits and did not expect to dine with him on any given night. He would make his dramatic reappearance when he could. Although, Sherlock was happy to fold me into his cases where he could, but my schedule did not often permit it. Indeed, in our chase across Europe for an individual who stole a certain object of whom and of which I am not yet allowed to speak publicly about, I was left with many hours to catch up on at the practice. How I long for the days of yore when doctors could hand their practices off for a day or so. I'd known Sherlock to sit in silence when presented with a new case and decided to leave him to his thoughts. I proceeded to make the quietest cup of tea possible, but interrupted his reverie none-the-less. "Wouldn't you like to know what I've been reading?" His eyes sparkled in that way of his, and I told him I would. "We've become players in an online drama," he said, his eyes diverting back to the laptop's screen. 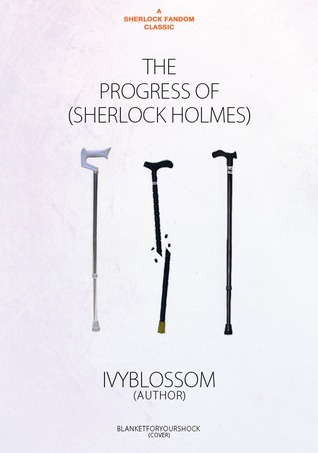 "The Progress of Sherlock Holmes." I continued to stand by the counter and asked if he would like some tea. "How can you ask - tea? Full strength, please." I obliged. "So, are they attempting to solve you, turn you into a mundane like the rest of humanity?" I brought the tea to the sofa, "She's not in love with you, is she?" I sighed, "poor girl." "Just have a skim," he said, and I bent to read over his shoulder. I don't remember exactly what the text was, only that Sherlock was injured and had Tchaikovsky in his head. "I don't love Tchaikovsky," I balked and he snickered, "do I?" He conceded: "you seem to like everything, except Mozart. But no, I don't think you've ever said you love Pyotr." I continued reading and then froze. "Is it another romance?" His reply was curt and affirmative. I took the laptop from him and began to scroll through the thing, taking in Mary's name used so casually, and sat there in disbelief, looking from Sherlock, sipping his tea contentedly and back to the mass of text before me. "Interesting, isn't it. Almost true to life." It wasn't a question. "But this isn't true at all!" I objected. His eyebrows rose in amazement, "Yes, but isn't that the point in fiction? It's elaborate and colorful lies, the conceit is that there is any truth in it at all." "You sound like a fifteen year old girl, here." "Perhaps I am, emotionally. Also, I am a virgin 'here', so perhaps there is a parallel." "You don't give yourself enough credit." I continued to scroll. I huffed. "Written by someone who has read about substance abuse online or in school?" I offered. He snorted: "Abuse." I fixed him a look. He slurped his tea loudly. "I don't find your portrayal as sympathetic as you are in real life, but close," he said softly. "Pardon?" He began to repeat his words, but I cut him off, "I heard what you said." He paused before speaking again, finally saying, "you are even more companionable a person, and sympathetic a friend than the public could ever guess." I began to speak, but he interrupted my appreciation. "I don't think I would act like that if I were to fall in love with you, though. Although I might, I've never given it much thought." "Well," I fiddled with my tea, a bit annoyed at that point, "how would you call it true to life then?" He wove his hand, "in the abstract, John." He settled the cup down and turned to me. The laptop felt a bit like a shield from his intense stare. "Our friendship has been invaluable to me." "Yes, but not like this." I was exasperated. He rolled his eyes. "Obviously. But doesn't it intrigue you?" I turned away just as his put his face near mine. The seconds ran on in silence, the fire cracked away. "Sherlock." I spoke calmly, awaiting explanation. His big nose was close to my cheek and I could hear the air whistling through nasal passages. "John," was his reply. "Am I bothering you?" "Doubtless it's another experiment." I cleared my throat and waited. He squinted at me, "you grow increasingly adept." "Thank you." I repaid the compliment with a smile. "It's promising... and yet irritating, somehow." He stood from the sofa and left. I smiled for my own enjoyment then, perhaps a little too pleased with myself, and contemplated the eternal debate between Ethiopian and Spanish take-out. I bowed my head and conceded, there's always curry. 213,458 words. Archive of Our Own. 22nd March 2011.